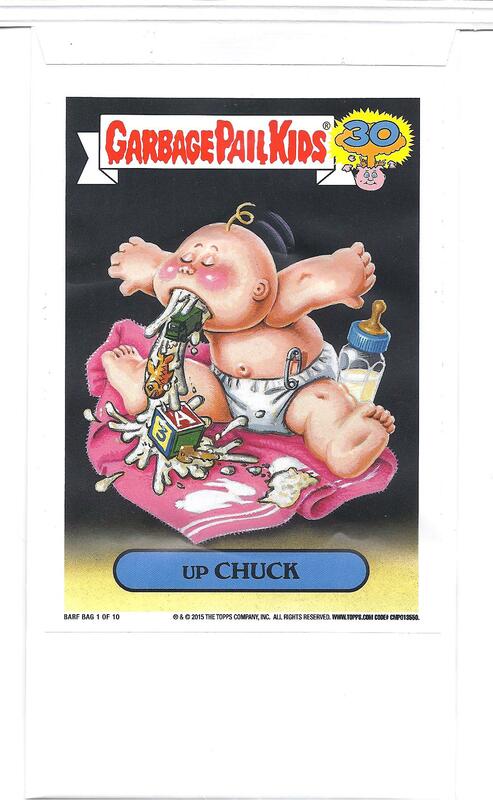 30 years ago, a set of cards called "Garbage Pail Kids" was released in order to lampoon the popular-at-the-time Cabbage Patch Kids. 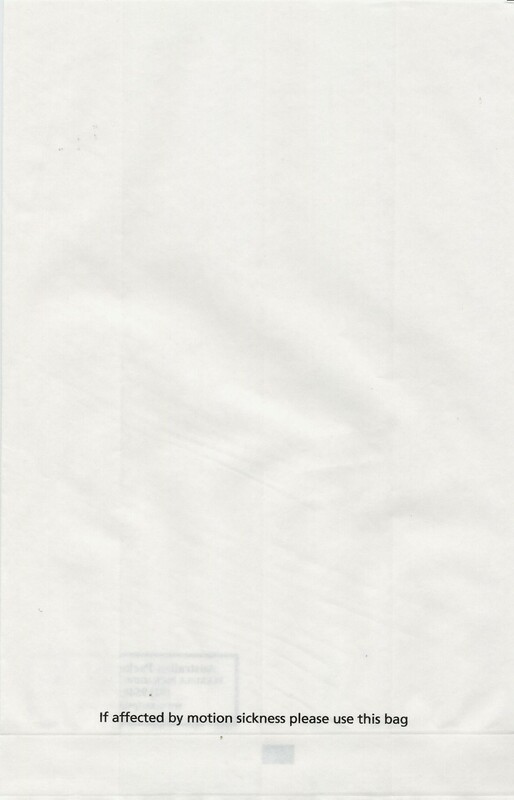 In 2015 Topps decided to re-release 10 of these cards on barf bags. Upchuck is number 1 in a series of 10. 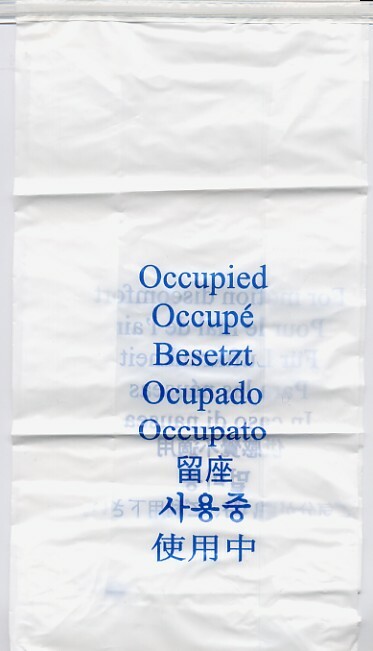 This bag's wonderful design is part of a maelstrom of controversy. 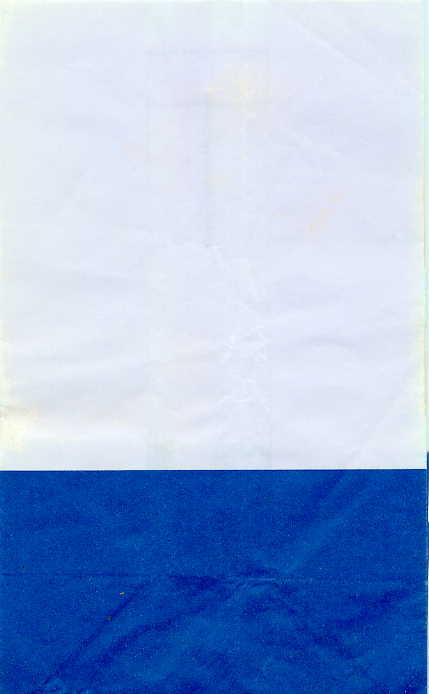 The "I'm empty and sad / I'm full and happy" cartoon design is used by Corsica Ferries and others. 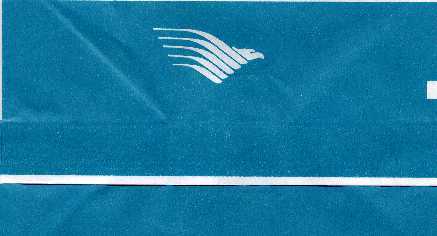 The design is ubiquitous enough to be a generic, but I believe that the desing has been stolen and proliferated among various transportation agencies. If you have information or the entire story, please let me know so I can edify the public. This bag looks like a poorly tiled linoleum floor. 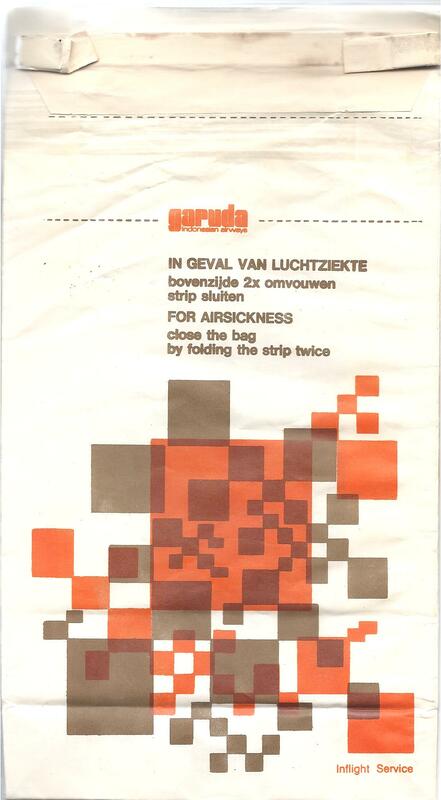 The back of the bag says, "IN GEVAL VAN LUCHTZIEKTE", which I think is Danish for "In God We Trust". Either that, or it's the name of an exotic dancer, as verified by the text, "strip sluiten". 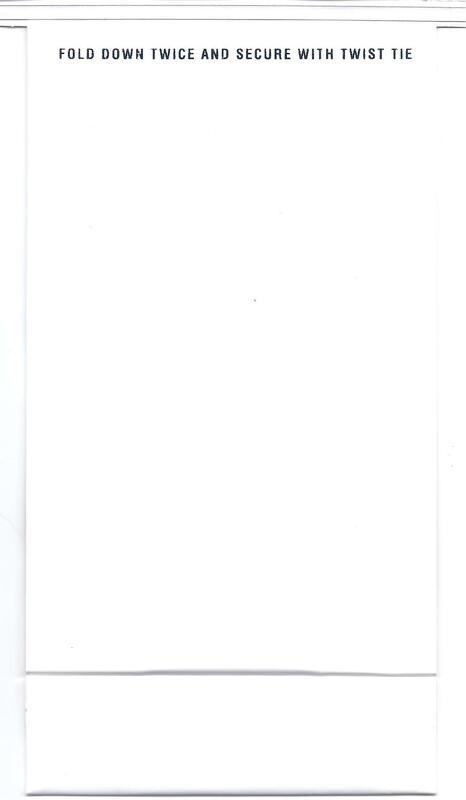 One other note. 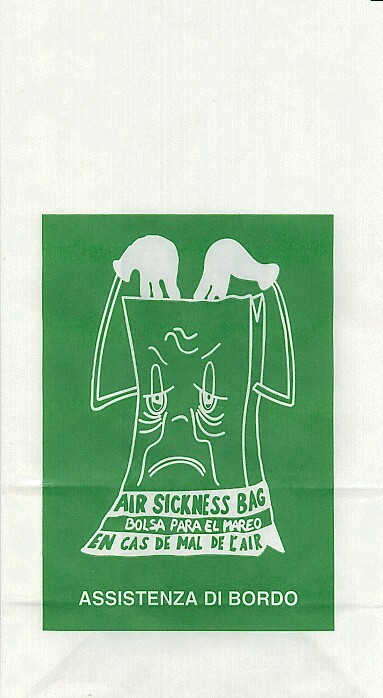 The front of the bag has the words, "Customer Service" on the bottom right, which sounds out of place, especially when throwing up. Vomiting expert Bart O'Brien to the rescue! 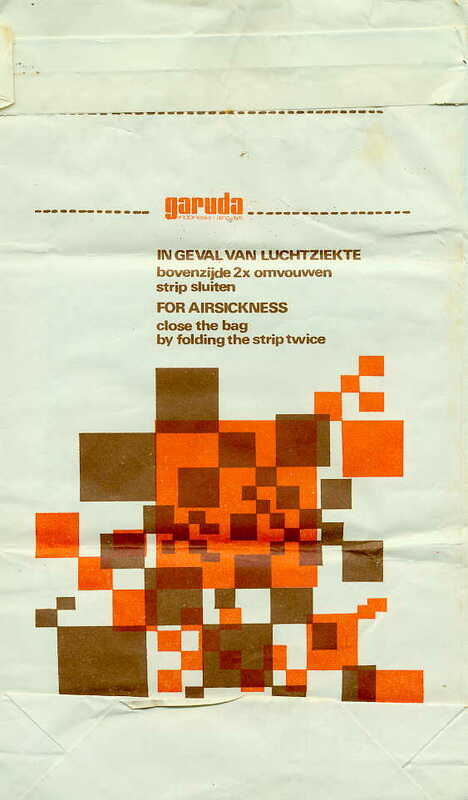 He says "IN GEVAL VAN LUCHTZIEKTE" is Dutch for 'In case of air sickness'. "strip sluiten" means 'seal the top’. 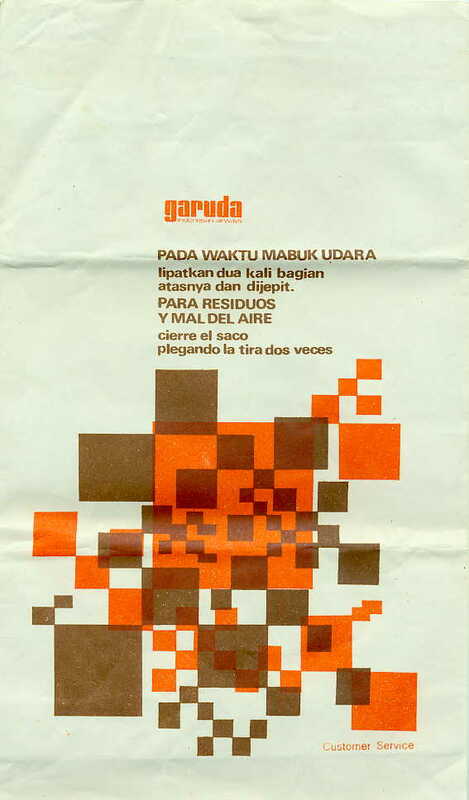 KLM used to do a lot of support for Garuda behind the scenes. So thanks for clearing that up! 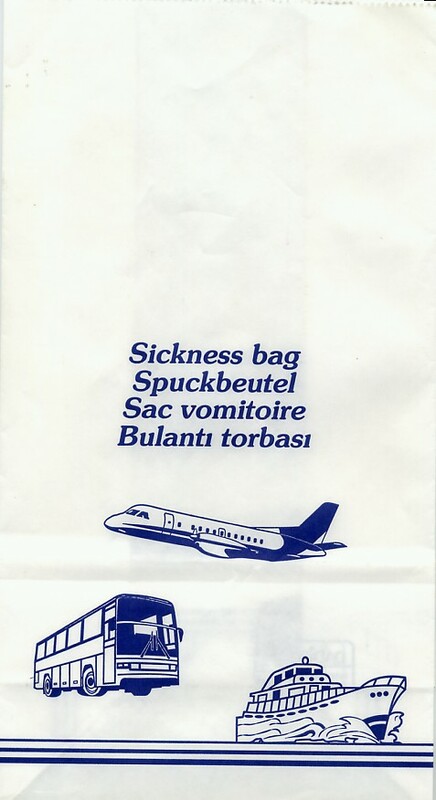 Garuda's design innovation allows sick passengers to see vomit in new see-through bag! 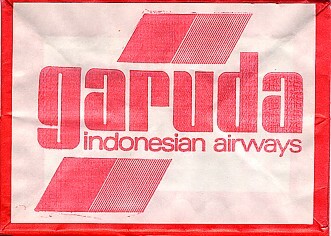 Of the blue downsized Garuda bags, this is the design that got it right. Big logo on the front, instructions on the back. Simple and elegant. Too bad they kept tinkering with it. 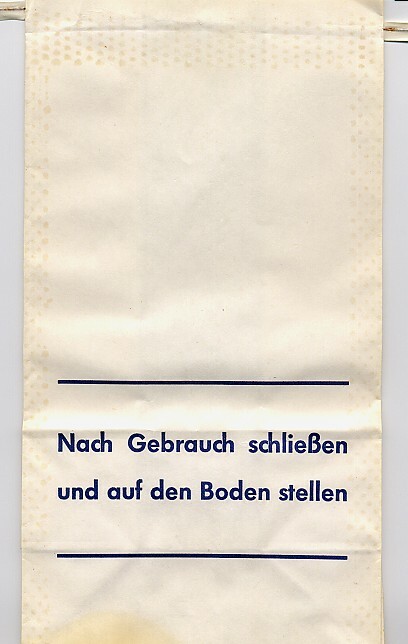 This is probably the smallest bag in the museum. Someone like Ted Kennedy could probably use 8 or 9 of these at a time. An almost exact amalgamation of the 1995 and 2000 versions. The bag got bigger! 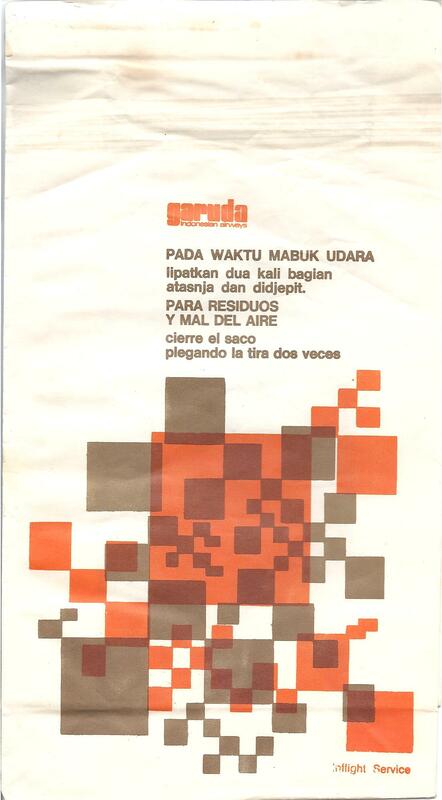 Rick says, "If you speak both English and Indonesian, you have a lot of folding to do" (See Side B). 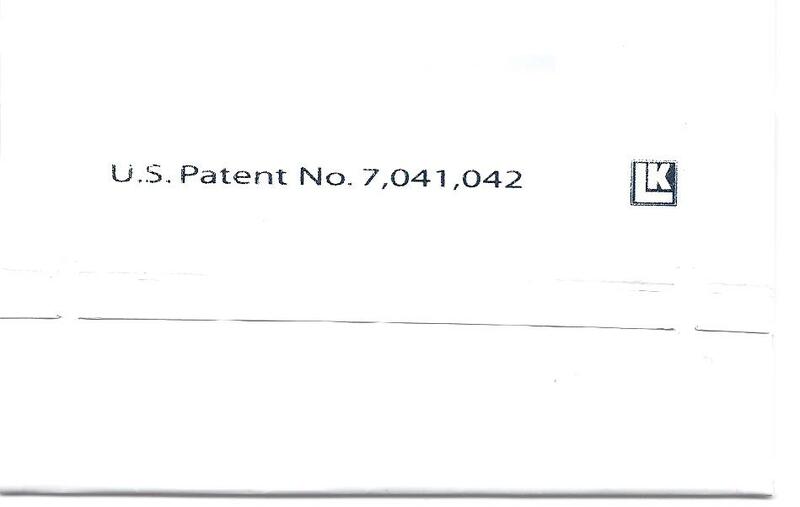 Rick also notes the error "Tear of Here". 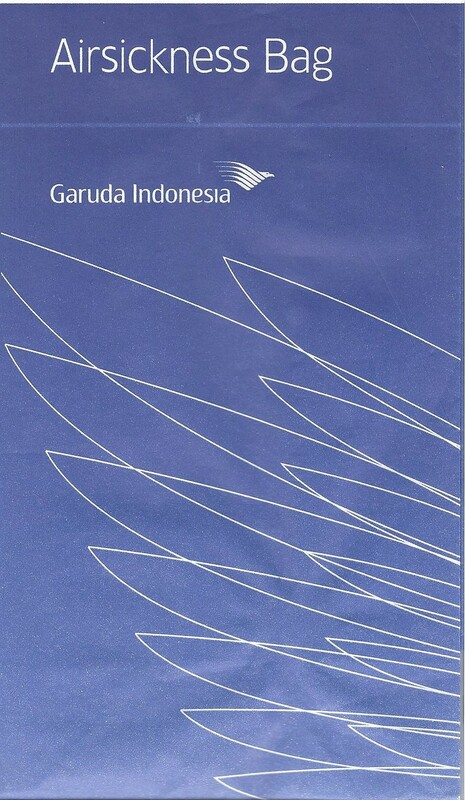 Garuda brings its back into the new millennium by adding Spirograph detailing. Very Old-Lufthansa-esque. Well marked on bottom. 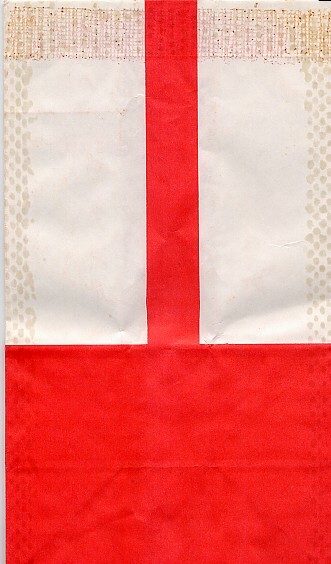 Identical to the other Garuda Red bag except inside the fold, it not only says ACS, but also 8 more lines of company contact info. 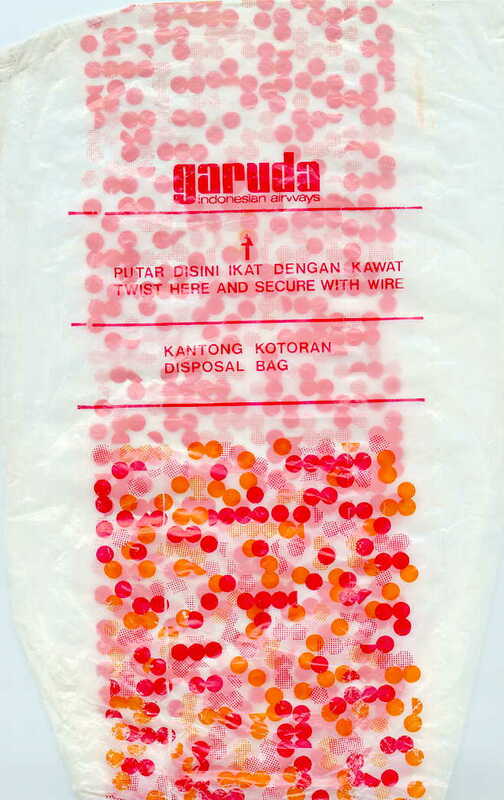 Great old bag from Indonesia. 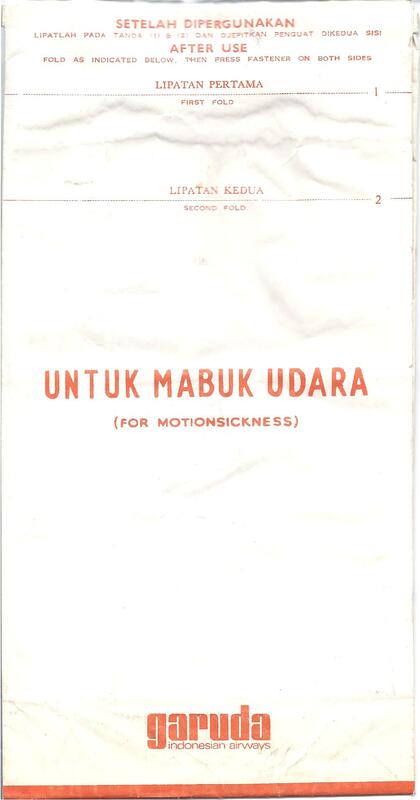 Instead of Beg Mabuk Udara, this says Untuk Mabuk Udara. 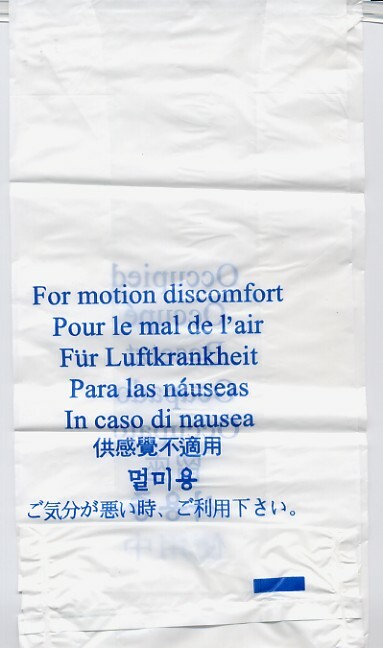 If I had even less of a life than I do, I'd compare the translations. Maybe you can do it for me? 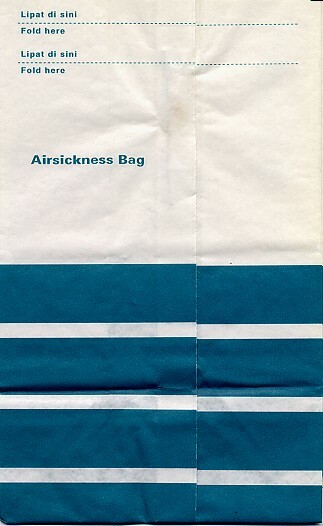 Great old Bag! 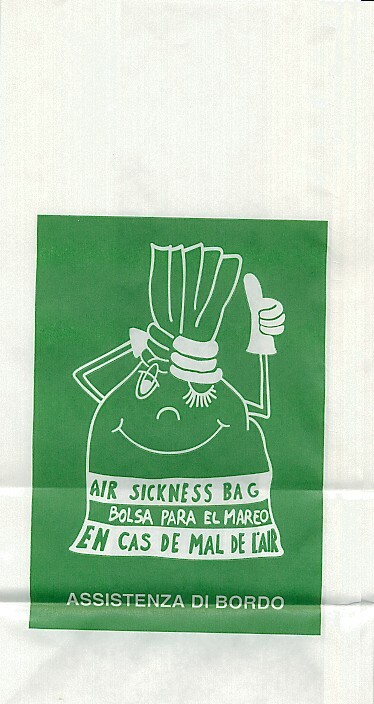 Identical to this one except that the bag says "Inflight Service" instead of "Customer Service". Not sure why they made such a bold decision. 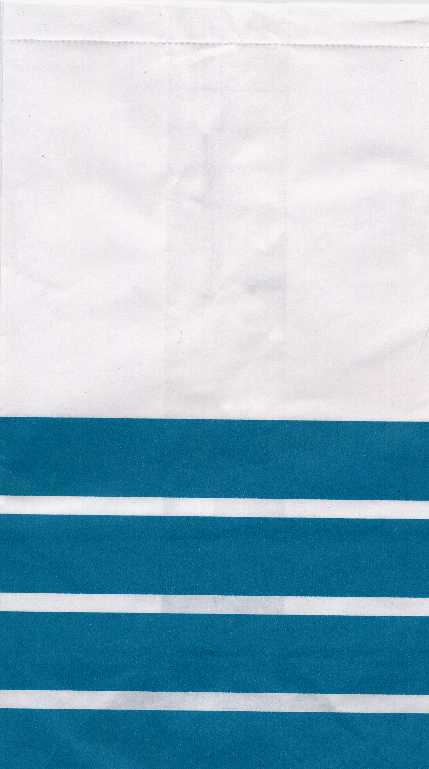 I don't know much about this bag, but I do know that there's a Russian company called Gazprom. 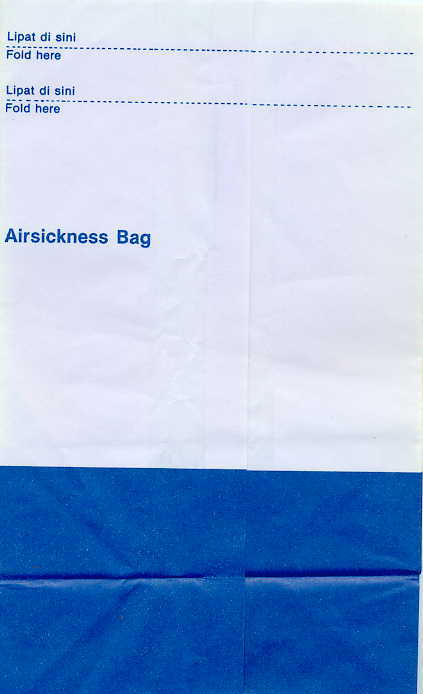 I wonder if the company issues its own bag. 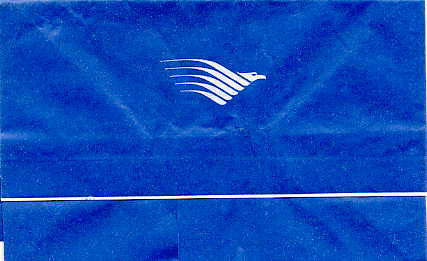 Adding to my suspicion is the pilot light above the G.
Defunct airline with patriotic band-aid logo. 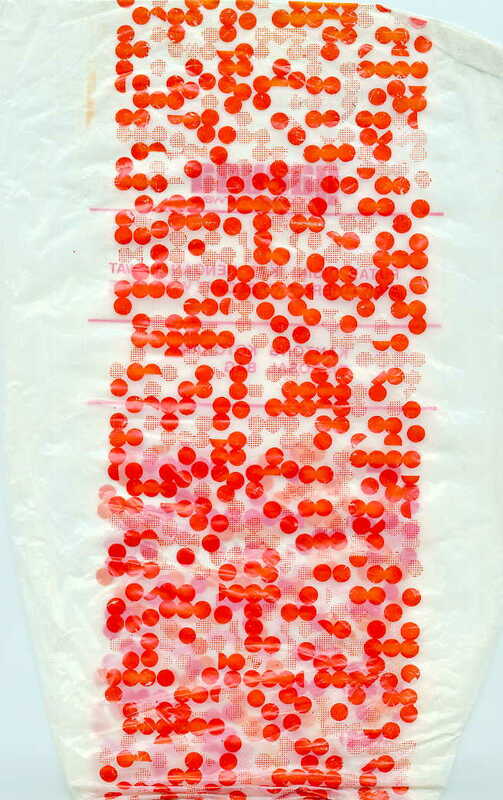 This is a fine bag with glossy red and blue printing that the scanner couldn't pick up, so it looks black. 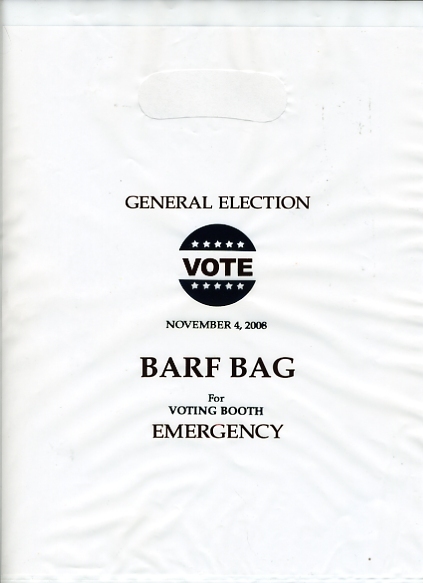 The bag says, "General Election Barf Bag for voting booth emergency. Vote. November 4, 2008." 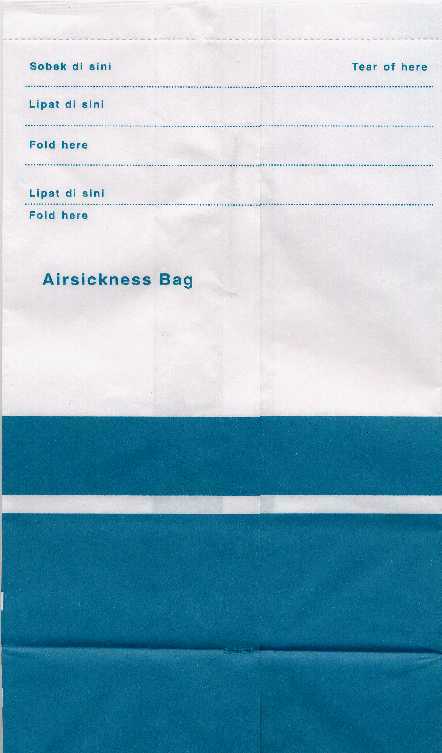 Bag manufacturer, Australian packaging Pty Ltd has started printing their return address on the back side of many bags they produce, such as Virgin Blue or Jet, but here's one that's completely generic for airlines with smaller budgets, I guess. 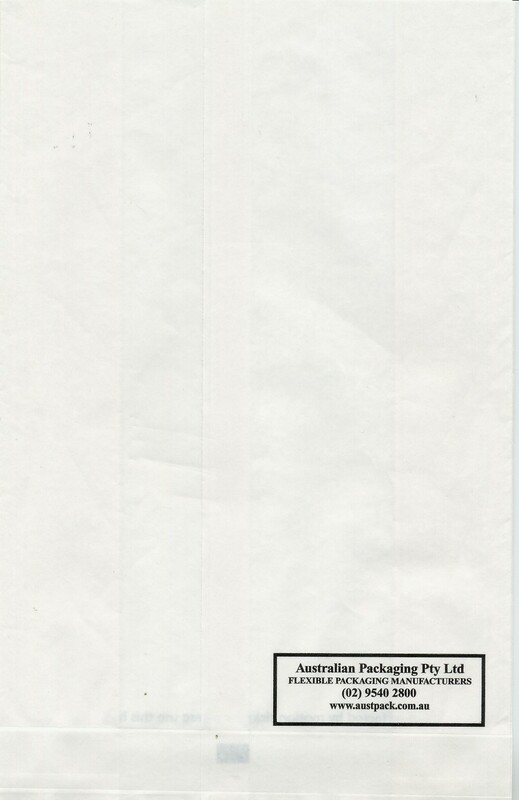 This bag is a plastic generic version that, except for the missing logo, looks exactly like the 2003 Delta bags. They are advertised as Boat bags, but they're really just generic. Ho hum. Good for most modes of transportation, but not trains.